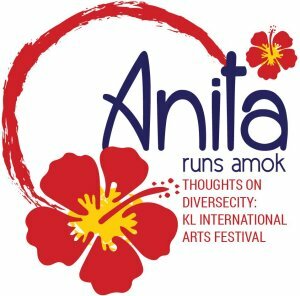 Meet Anita Ratnam running 'amok' among artistes, dancers, chefs, musicians and other creative minds. Why is the best of India rarely available at home? This was the question buzzing in my mind while watching the folk-opera (my own coinage) unfold onto the impressive DBKL auditorium. Two days earlier, I had watched a contemporary performance-art presentation that was both urban and international in flavour. 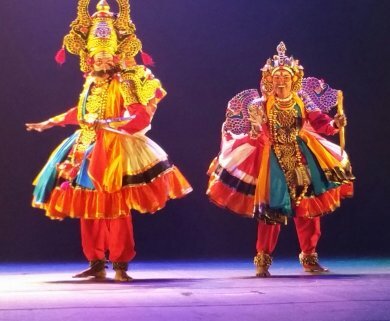 Now, I was witnessing decades of folk traditions, precious rituals and unpretentious artistes hurl themselves onto the proscenium stage and fill it with their natural vigour and colour. SIRIYAMMA SIRI is a Tamil term addressed to the native Goddess. It is a plea from the villagers who entreat the enraged Goddess-Devi to calm down after her furious encounter with the demon Dainika. The slaying of the enemy does not appease Her anger and the seething cauldron threatens to engulf the earth. Through song, dance, comedy and music the entire village joins in the appeasement and taming of the feminine energy. "Don't be angry, O Devi", they ask. "The entire world is not evil like Dainika. So LAUGH, O GODDESS, LAUGH!" 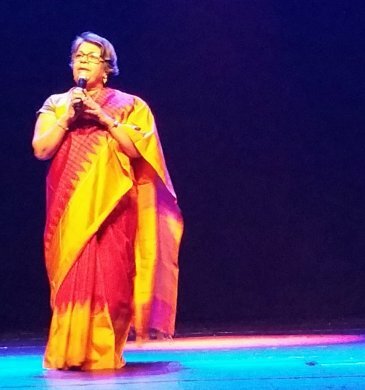 Envisioned by folklorist and Gandhian V R Devika, whose 30 year engagement with the rural arts has given her an inside eye into the entire landscape and challenges of the folk artistes of South India, the multi layered evening reflected her sure footed grasp on the complexities of the performance. For many artistes, it was their first journey across the oceans. First time passport holders, new costumes, interaction with other folk artistes and submitting to the larger story in which so many genres and styles of folk and ritual traditions merge would have been a first for many of them. Charming in their natural naiveté, the storytellers (katttiyakaran) and the gypsy (kurathi) were full of unspoilt verve. 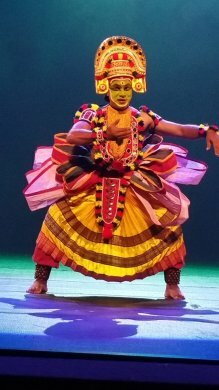 The dynamic Therukoothu performers whirled onto the stage in their spectacular garb but the scene stealers were the Padayani artistes from Kerala. I watched backstage while they diligently cut the palm leaves to make their elaborate skirts, head dresses and arm accessories. The result when they walked onto the stage was simply breathtaking. While the story of the angry Goddess confronting the demon and the subsequent fallout formed the skeleton of the story, the multiple devices that Devika chose to move the narrative forward was particularly engaging for a viewer like myself. Having interacted with Tamil folk and ritual forms for decades, I was very aware of the challenges directors and cultural interlocutors face when asked to compress an all night celebration into a 75 minute performance capsule. Each of the performers come with their attendant rituals and sacred observations. These traditions are hereditary and not taught to many outsiders. Language poses the most difficult obstacle with colloquial phrases used for humorous intersections. Working the hardest and pulling all the elements together was dance-actor Sangeetha Iswaran. A Bharatanatyam dancer now working with children and special communities in Thailand and Indonesia, Sangeeta transformed into many avatars. Angry Goddess, sarcastic narrator, village woman - every entry became the glue holding the disparate elements together. I longed to have super titles translating the Malayalam songs and Tamil dialogues for the audience, but the sensitive crowd seemed to throw themselves into the spirit of the evening without hesitation. SIRIYAMMA SIRI benefited with the skill of the lighting magician Sivarajah Natarajah of Sutra. An artist by profession, we have seen his ability to paint the stage whenever SUTRA has performed in India. For this performance Siva carefully sculpted and tinted each section, keeping the costume and headgear in mind and miraculously softened the rough edges of each folk form, especially during the entrances and exits. The resulting sophistication was a feast for the eyes. Each artiste brought their own flavour to the evening and no one person can be singled out. From the musicians placed in a diagonal corner and lit delicately, to the multiple pools of intersecting light for each of the main players as they performed their sections, it was a triumph of ensemble. With repeated shows, the work will mature and gain tautness which is needed in its premiere viewing. For me, the Ottam Thullal solo by Suresh Kaliyath was memorable for the physicality being projected as monkey God Hanuman. The Kattiyakaran - Kurathi tattoo interlude brought a smile to many a face. Therukoothu continues to thrill me with its sheer force and energetic theatricality. The final Padayani solo trance by Rajmohan was hypnotic and powerful. Backstage was organized chaos. Devika credits the stage management of the crew for ensuring the smooth costume changes and timely exits and entrances for the complex evening. How much we in Indian theatre practice can learn from the professionalism of theatre staff and when can we hope to bring such evenings to urban audiences in our hometowns? SIRIYAMMA SIRI was not just a successful showcase of South Indian folk and ritual theatre traditions coalesced into an evening length performance. It was also a reminder that jaded urban eyes need to be refreshed and reminded of the power of the soil and the constant inspiration of traditional art. Throughout history, great directors, choreographers, photographers and visual artists have drawn inspiration from time honoured traditions. The earth speaks… We just have to put down our hand helds, look up and listen!